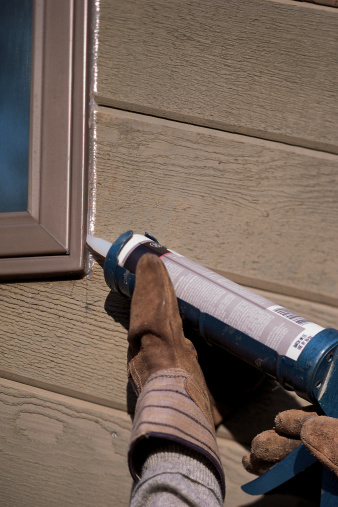 Caulk is typically applied along joints or seams to seal out moisture. Over time caulk can dry out, stain or break away from the joint, and must be replaced to prevent moisture from seeping between the joints. 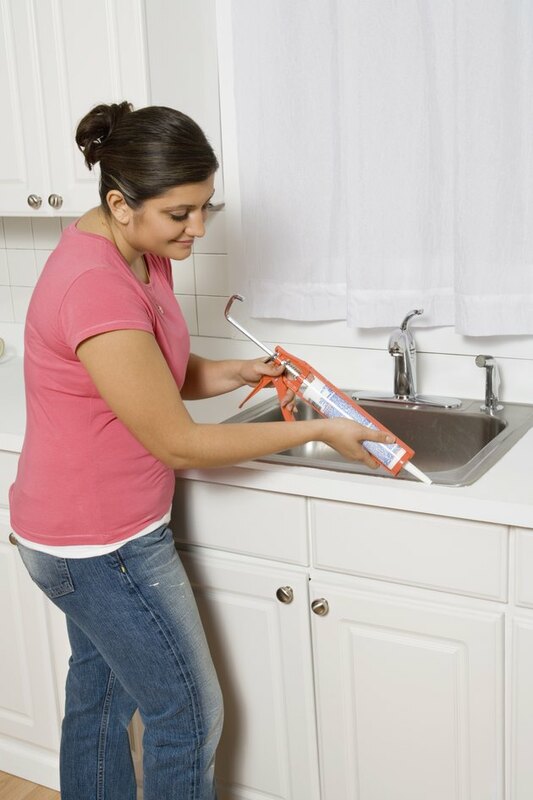 Many caulks are available in squeezable tubes or in rigid plastic tubes that you apply with a caulk gun. Most homeowners can replace caulk themselves with a few simple tools. The key to a good seal with new caulk is to ensure the surface is clean and dry. Score the old caulk along the joint using a utility knife. 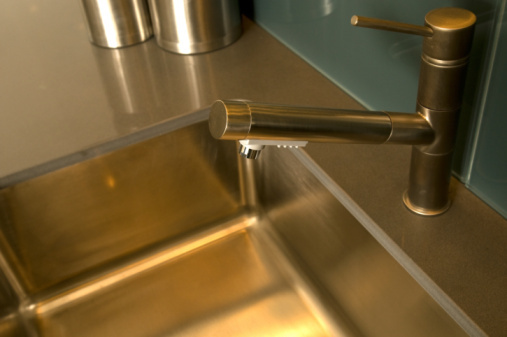 Avoid gouging or scratching adjacent surfaces such as wood, metal or enamel. Scrape away the old caulk using a paint scraper. Metal scrapers will scratch enamel and plastic. On these surfaces, a plastic putty knife prevents damage. Wipe away all dirt, dust, grease and debris with a damp cloth. If you are removing old silicone caulk, clean the residue with a cloth soaked in mineral spirits. Scrub stubborn residue with a dry nylon scrubbing pad and rinse the area thoroughly with clean water. Dry the joint with a clean towel or rag. Do not apply caulk until the joint fully dries. Mask off the area around the joint where you don't want caulk to appear with painter's tape. This also ensures your caulk line is straight, giving the final result a cleaner look. Read the product packaging for manufacturer's instructions and recommendations for use. Some caulks have a nozzle with a foil seal that you must puncture before use. Cut a small fraction of the nozzle tip away at a 45-degree angle. If your caulk comes in a squeeze tube, scissors will cut the tip with ease. If you're using a rigid plastic tube installed in a caulk gun, use a utility knife to cut the tip. Squeeze a small amount of caulk onto a piece of cardboard to check the bead size. If it is too narrow, trim a bit more from the tip. Trim only in small increments. The farther down you cut the nozzle, the wider the caulk bead or line will be. Place the caulk tube into a caulking gun if it is not a squeeze tube. Hold the nozzle against the joint at a 45-degree angle and squeeze the caulk into the gap. Fill the entire joint with an even bead of caulk and then drag a caulk finishing tool over the joint to smooth out the bead. If you don't have a finishing tool, you can press the joint smooth with a damp rag. Remove the painter's tape before the caulk develops a firm skin. This typically occurs between 2 and 6 hours after applying. Lift the edge of the tape away from you at a 45-degree angle when removing it and smooth the bead once more after the tape is gone to blend away any ripples caused by the tape. Dampen a clean cloth with water and wipe away excess caulk before it dries. If any caulk dries outside the joint, you must scrape it away. Allow at least 24 hours for the caulk to fully cure.